Staughton Lynd on rank-and-file movements, the IWW and recent union organizing efforts at Wal-Mart. From the beginning, the Occupy movement has been asked: What are your demands? A more important question is: Is there a way that the dynamism of Occupy and the residual energy of the rankand- file labor movement might coalesce? Most intriguing of all is the query: In that other world which we say is possible, could it come to pass that Occupiers, and the practitioners of working-class self-activity who make up the Industrial Workers of the World, could come to be a single force of radicalism from below? What Is A “Rank-And-File” Movement? To begin with, we need to define what we mean by the words “rank and file.” For half a century, the term “rank and file” has most often been used to describe a movement to elect new union officers. Think of Miners for Democracy and its candidate for president of the United Mine Workers (UMW), Arnold Miller; Ed Sadlowski’s campaign for president of the United Steelworkers; Jerry Tuckers’s run for top office in the United Auto Workers (UAW); or Ron Carey’s successful candidacy for president of the International Brotherhood of Teamsters. The term “rank and file” was even used to characterize the elevation of John Sweeney and, later, Richard Trumka, to the presidency of the AFL-CIO. And countless campaigns for local union office borrowed the words “rank and file” to describe their own election efforts. In Youngstown, Ohio, insurgent steelworkers like Ed Mann and John Barbero called themselves the “Rank And File Team,” or RAFT. The problem with this understanding of a rank-and-file movement is that John L. Lewis imposed on the incipient CIO a template or paradigm of successful union organizing that has rarely been challenged by subsequent, purportedly “rank-and file,” candidates for union office. Lewis ruled the UMW autocratically throughout the 1920s. Opposition movements led by socialists were outlawed and crushed. Since then, successful union organizing has been understood to have the following invariable components: (1) The union is recognized by the employer as the exclusive representative of workers in an appropriate bargaining unit; (2) New employees automatically become union members after a relatively short probation period; (3) The employer deducts dues from the worker’s paycheck and forwards the money to the union; (4) The contract forbids strikes and slowdowns for the duration of the collective bargaining agreement and (5) also includes a clause giving management the right to make unilateral investment decisions. There is a widespread belief among labor historians that Lewis led the way to recognition of the CIO in steel, rubber and auto by a masterful organizing strategy among soft coal miners. Jim Pope, in a series of densely documented articles, has shown this story to be myth. Selforganization and the formation of new union locals among miners in western Pennsylvania were initially opposed by UMW staff. When 100,000 miners went on strike in the summer of 1933, Lewis and his lieutenant Phil Murray (later president of the Steelworkers and the CIO) made deals with the government to end the strikes without seeking rank-and-file authorization. In response, militant miners used their elected pit committees to form a network of resistance. Roger Baldwin of the American Civil Liberties Union (ACLU) actually opposed the National Labor Relations Act (NLRA, or the “Wagner Act”) of 1935, fearing that it would institutionalize and legitimate the Lewis paradigm and thus make impossible a breakaway movement like the Progressive Miners in southern Illinois. CIO unions in basic industry, despite their insurgent rhetoric, became mechanisms for winning material benefits while simultaneously surrendering workers’ hopes for workplace democracy. In 2000 we published a second collection of interviews, and then in 2011 an expanded edition of “Rank and File” (Haymarket Books) containing all the interviews in the first book plus eight interviews from the second. Over time, an oral history in the original “Rank and File” to which we often found ourselves referring was that with John Sargent. Sargent had been the first president of the Steelworkers Organizing Committee at Inland Steel in East Chicago, Ind. After the Steelworkers was recognized by management as the exclusive representative of the 18,000 workers at Inland, Sargent was elected for several terms as local union president. Sargent’s heretical thesis was that steelworkers at Inland accomplished more before the Steelworkers was recognized as their exclusive representative than they did afterward. The reason, he asserted, was that, as exclusive representative, the Steelworkers, like other CIO unions, gave up the right to strike for the duration of the collective bargaining agreement. Before then, management was obligated to bargain with the local CIO union, but also bargained with the socalled company union sponsored by the employer, “and any other organization that wanted to represent the people in the steel industry.” There was no comprehensive contract covering all those who worked at Inland. As a result, there was no clause giving up the right to strike and the workers progressed by small victories won by direct action. In putting together our second collection of rank and file interviews, my wife and I became aware that different groups of workers were feeling their way toward re-creating the working-class self-activity, the unionism from the bottom up, that John Sargent experienced in the late 1930s at Inland Steel. Here are thumbnail summaries of some of the new interviews we added to the original “Rank and File” in the expanded edition. Vicky Starr, who, in the original “Rank and File,” described how she helped to organize packinghouse workers in the 1930s, told about forming a union of clerical workers at the University of Chicago in the 1970s and 1980s. She said that before the National Labor Relations Board (NLRB) election and before they got a contract, she and fellow workers raised and resolved specific grievances. Marshall Ganz had been a volunteer for the Student Nonviolent Coordinating Committee (SNCC) in one of the most dangerous parts of Mississippi. From 1965 to 1981 he worked with César Chávez and the new United Farm Workers (UFW) union in California. Farm workers were not covered by the NLRA, and that left them free to pursue the tactic of boycotting stores in which an employer’s product was sold. It worked. The Schenley Liquor Company, who owned the vast majority of the vineyards, signed a contract with the UFW. Mia Giunta came from a workingclass family in eastern Pennsylvania. She got a job as an organizer for the United Electrical, Radio and Machine Workers of America (UE). At F-Dyne Electronic in Connecticut she and other UE members rejected the practice of laying off workers in order of seniority. Strict seniority in layoffs meant that the newest hires might be put on the street with nothing, while others— typically white males—continued to work full time and even to work overtime. Mia and her colleagues searched for, and found, ways in which all employees agreed to receive a little less so that everyone could stay on the job. Members of the Chinese Staff and Workers’ Association told how new workers’ organizations can reach out horizontally to the community, rather than vertically to regional or national union offices. Students took part in a hunger strike in front of a restaurant, the practices of which they protested. The IWW is a natural place to look for the alternative structure that Ed Mann imagined. The Wobblies stand in the imagination of labor people as the embodiment of rank-and-file self-activity. They are understood to orient themselves to folks at the bottom rather than to union leaders and their election contests. But here we need to be good historians and to recognize an important fallacy in the original Wobbly perspective. The IWW was formed in 1905 at a conference with one major emphasis, which was expressed in the call to the conference issued in January 1905 by three dozen individuals including Bill Haywood, Mother Jones, and Eugene Debs (see the new edition of “Rebel Voices,” ed. Joyce Kornbluh, page 7-9). Their manifesto deplored trade and craft divisions that broke the workers’ collective “power of resistance.” The separation of crafts and trades was said to be “outgrown” and “long-gone.” It was assumed that the formation of industrial unions would increase class consciousness. The same theme was emphasized by Debs in a speech he gave in Chicago the next November, after the founding conference. Drawing on his own experience among railroad workers, Debs declared: “We insist that all the workers in the whole of any given plant shall belong to one and the same union.” (The speech is conveniently available in “American Labor Struggles and Law Histories,” ed. Kenneth Casebeer, page 91-99). The implicit perspective, embodied as well in the IWW Constitution, is that the industrial union form of organization in itself fosters class consciousness, solidarity, and labor radicalism. But we know now that this is not the case. The United Mine Workers (UMW) was an industrial union, albeit within the old American Federation of Labor. Under Lewis’s leadership the UMW proved once and for all that an industrial union could be just as conservative and undemocratic as the craft unions it replaced. Only in the past few years have IWW organizers seriously begun a search for new organizational forms and a qualitatively new and more radical kind of labor union. The examples with which I am most familiar are the Workers Solidarity Club of Youngstown, a “parallel central labor union” that offered significant strike support in the 1980s, and the more recent “solidarity union” at Starbucks establishments in New York City and elsewhere. Daniel Gross is the principal IWW organizer at Starbucks, and he and I have written a pamphlet called “Solidarity Unionism at Starbucks” available from PM Press in Oakland, Calif. The main idea is that the NLRA has two parts, and you can use one while avoiding the other. The part to be avoided, according to Fellow Worker Daniel and myself, is Section 9. This is the section that provides for—guess what?—election of an exclusive collective bargaining union representative, the very practice John L. Lewis wished to make universal. A recent book by a labor law professor, Charles J. Morris, argues that this practice was not universal when the NLRA was enacted. Morris contends that the initial conception was that an employer had a duty to bargain with any organization of its employees that requested negotiation, whether or not the organization claimed to represent a majority of the employees. This was the practice John Sargent reported to exist at Inland Steel for several years after the Little Steel Strike of 1937. Obviously such a “minority union” could not, practically speaking, bargain away the right to strike embodied in Section 13 of the NLRA for all the workers at a particular worksite. On the other hand, Daniel and I argue that Section 7 of the NLRA, which protects the right to engage in “concerted activity for mutual aid or protection,” should be embraced and fully used. Section 7 is the basis for unfair labor practice (ULP) charges by employees who are fired or discriminated against when trying to act together in the workplace. It seems to us that in this way rankand- file workers can safeguard the selfactivity by means of which they seek to address specific problems as they arise, while at the same time avoiding the part of the NLRA that empowers majority unions to bargain away the right to strike. What Is Happening At Walmart? The recent upsurge of rank-and-file activity at Walmart stores and warehouses in the United States has not, so far as I know, been led or inspired either by participants in Occupy or by members of the IWW. What it represents is the spread of characteristic Wobbly forms of self-activity to workplaces where those practices arise spontaneously because they speak to the needs and opportunities actually experienced by Walmart workers. Walmart is the country’s largest private employer, reporting 1.4 million employees in the United States at 4,300 stores. The company claims that full-time employees make more than $13 an hour. Workers say that most of them work part-time for less than $10 an hour. Colby Harris in Dallas makes $8.90 an hour and says that workers need a “buddy system” to make it through “non-paycheck weeks.” Also according to Walmart workers, health care benefits are theoretically available, but they are too expensive and too many hours are required before a worker qualifies to receive them. Sixty percent of Walmart’s hourly employees are women, who brought a nationwide lawsuit against the company that the United States Supreme Court held could not be pursued as a class action. Meanwhile, Walmart made a profit of $15.4 billion in 2011, and $4 billion in the first quarter of 2012. In mid-September, warehouse workers for Walmart in southern California went on strike to protest unsafe working conditions: broken equipment, dangerously high temperatures, inadequate access to ventilation and clean drinking water. These are temporary employees, hired by a Walmart contractor and paid minimum wage. Strikers marched on a 50-mile “Walmarch” from their worksite to Los Angeles to raise public awareness. Old-timers may have been reminded of the farmworker pilgrimage from Delano to Sacramento in the 1960s. Over 120,000 persons signed a petition supporting the Walmarchers. They went back to work Oct. 5 with a promise of improved conditions. It is reported that workers from different countries marched into the workplace carrying their countries’ flags. Elwood, Ill., on the outskirts of Chicago, is a strategic link in the Walmart supply chain. Walmart’s warehouse there is said to process 70 percent of the company’s domestic goods. This was what made it possible for a strike by just two dozen workers to be so successful. Some of the grievances of the Elwood strikers had to do with wage theft resulting from forced overtime and the lack of set working schedules, as well as inadequate safety equipment. These temporary workers have had a hard time finding housing. Mike Compton told a reporter that he sleeps in foreclosed homes. Another worker set up a tent in the woods. The first step at Elwood was to circulate and present a petition on Sept. 15. Four workers were immediately fired. Other workers walked out in protest. On Oct. 1, the striking workers were joined by more than 650 community supporters, including members of the clergy, many of them bused in from Joliet and Chicago. Seventeen more persons were arrested in a civil disobedience action planned in advance. The arrestees included national UE Director of Organization, Bob Kingsley. On Oct. 5, strikers delivered a petition to Walmart management with more than 100,000 signatures. The next day, after three weeks “on the bricks,” the Elwood workers went back to work. The company actually paid them full back pay for the time they were on strike. One result of this ferment was a meeting of Walmart executives on Oct. 17 with delegations of workers from warehouses in California and Illinois. This was in striking contrast to the past practice of meeting with individual workers pursuant to the company’s “Open Door” policy. Workers also want the Open Door process itself revised so that: (1) Confidentiality is respected; (2) Resolution of issues is put in writing; and (3) “Associates” (as Walmart calls its employees) are permitted to bring a co-worker to meetings as a witness. Rather than presenting themselves as new members of existing unions, these wildcat strikers have formed new organizations with names like Warehouse Workers for Justice and OUR Walmart (OUR standing for “Organization United for Respect”). It is important to recognize that existing unions, especially the United Food and Commercial Workers, support these new entities in many ways, including financial support, and no doubt hope that Walmart workers will ultimately join the union. But it is equally important to recognize that nothing obliges Walmart workers to join a traditional union, if they prefer to continue their less traditional practices of horizontal mutual aid. Emboldened by the actions of their fellow workers in company warehouses, Walmart “associates” at company retail stores staged a one-day strike on Oct. 4. More than 70 workers from at least nine southern California Walmart retail stores took part. Using social media, strikers spread the word and a nationwide walkout followed on Oct. 9. More than 200 Walmart workers also showed up at a national meeting of company executives on Oct. 10. “Democracy Now!” reported that they came from 28 Walmart stores in 12 different states. 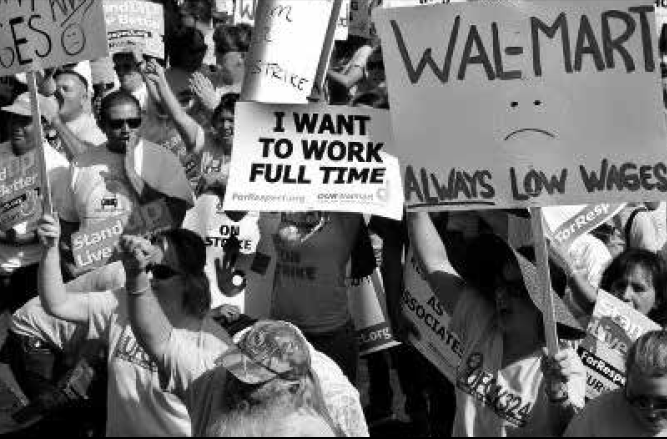 As I complete this essay in early November 2012, there is talk that if Walmart continues to ignore these bottom-up demands for change, Walmart workers will call for a nationwide boycott of their stores on the Friday following Thanksgiving (otherwise known as “Black Friday”). The Occupy movement is a potential actor in the play. Events at the grain terminal in Longview, Wash., one year ago remain controversial. I think the evidence suggests that Occupy volunteers strengthened the struggle, and that the International Longshore and Warehouse Union (ILWU) settled for too little, indeed that Pacific Northwest grain exporters wish to copy the Longview contract in their bargaining elsewhere. Alice Lynd contributed to this piece.